The inner transition elements are two series of elements known as the lanthanoids (previously called lanthanides) and actinoids (previously called actinides). They are usually shown below all the other elements in the standard view of the periodic table, but they really belong to periods 6 and 7. The lanthanoid series consists of the 14 elements cerium through lutetium (atomic numbers 58–71), which immediately follow lanthanum. Likewise, the actinoid series consists of the 14 elements thorium through lawrencium (atomic numbers 90–103), which immediately follow actinium. These elements were among the last to be discovered and placed in the periodic table. Many of the actinoids do not occur naturally but were synthesized through nuclear reactions. Chemically, the elements within each series (especially the lanthanoids) are very similar to one another. Many lanthanoids are used for producing lasers, sunglass lenses, and strong magnets. Some radioactive isotopes of inner transition elements are used to date rocks, minerals, and fossils. The two most well-known actinoids are uranium (U) and plutonium (Pu), which are used in nuclear weapons and nuclear power plants that generate electricity. The International Union of Pure and Applied Chemistry (IUPAC) currently recommends using the names lanthanoid and actinoid, rather than the earlier terms lanthanide and actinide, because the suffix "-ide" is generally used for anions. The definition of inner transition elements is somewhat imprecise. Some include lanthanum and actinium to give 15 elements in each series. From the standpoint of their electronic structure, the lanthanoids are characterized by the gradual filling of the 4f subshell, and the actinides, by the filling of the 5f subshell. Consequently, they are also called "f-block" elements. In these elements, however, the outermost d and f subshells lie close together in energy, leading to some irregularities in electronic structure. These irregularities in turn lead to some uncertainty about where to place the elements (see the periodic table showing electron configurations). Lanthanum and actinium have no electrons in their f subshells, and they best fit with the elements of group 3. Cerium and thorium also have no f electrons but are considered part of the inner transition element series. A common arrangement is to place the inner transition metals between groups 3 and 4 as shown in the inline table. Placement of the lanthanoids and actinoids in the periodic table can be observed in the wide version of the table below. those numbered in red are synthetic (all are solid at STP). those numbered in gray have not yet been discovered (they also have muted filled colors indicating the likely chemical series they would fall under). The term lanthanoids indicates that the elements in this series follow lanthanum in the periodic table. The 14 elements in the lanthanoid series are: cerium (Ce), praseodymium (Pr), neodymium (Nd), promethium (Pm), samarium (Sm), europium (Eu), gadolinium (Gd), terbium (Tb), dysprosium (Dy), holmium (Ho), erbium (Er), thulium (Tm), ytterbium (Yb), and lutetium (Lu). Together with scandium and yttrium, the lanthanoids are also sometimes referred to by the trivial name "rare earths." This name is not recommended by the IUPAC, as these elements are neither rare in abundance (even the least abundant, lutetium, is more abundant in the Earth's crust than gold), nor are they "earths" (an obsolete term for oxides). The lanthanoids are chemically similar to one another, and useful comparisons can also be made with scandium, yttrium, and the actinides. Except for cerium and europium, the lanthanoids occur naturally in ionic compounds as ions with a 3+ charge. Going down the series, the radii of the lanthanoid 3+ ions decrease—a phenomenon known as the "lanthanoid contraction." The 3+ oxidation state is a universal preference for these elements. As a consequence, their geochemical behavior is a regular function of ionic radius and, therefore, atomic number. This property results in variations in the abundances of lanthanoids. It also makes them difficult to separate. Chemically, the lanthanoids react with water to liberate hydrogen. In this regard, they resemble the alkali or alkaline earth elements more than they do the transition metals. Although the 3+ oxidation state is the most important, the 2+ state is also important, especially for europium and ytterbium, and cerium forms a stable 4+ ion. Most lanthanoids are widely used in lasers. Given that they can deflect ultraviolet and infrared rays, they are commonly used in sunglass lenses. A number of lanthanoids—such as cerium, neodymium, and samarium—can be alloyed with other metals to make strong permanent magnets. In addition, two of the lathanoids (Sm and Lu) have radioactive isotopes (147Sm and 176Lu) with long half-lives, and they are used to date minerals and rocks from the Earth, Moon, and meteorites. The actinoid series, in a fashion similar to the lanthanoid series, is named after the element actinium. The 14 elements in the actinoid series are: thorium (Th), protactinium (Pa), uranium (U), neptunium (Np), plutonium (Pu), americium (Am), curium (Cm), berkelium (Bk), californium (Cf), einsteinium (Es), fermium (Fm), mendelevium (Md), nobelium (No), and lawrencium (Lr). 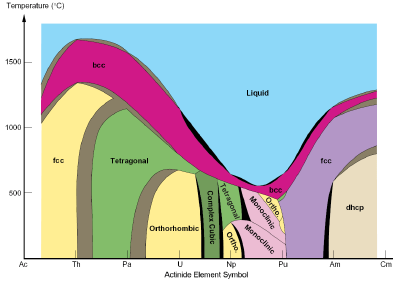 Phase diagram of the actinoid (actinide) elements. In many ways, the chemical properties of the actinoids repeat those of the lanthanoids, but the similarities among the actinoids are less pronounced than those among the lanthanoids. There is an "actinoid contraction," but it is less regular than the lanthanoid contraction. In addition, the actinoids exhibit a wider range of oxidation states. Initially, this led to some confusion as to whether thorium and uranium should be considered d-block elements. Unlike the lanthanoids, all the actinoids are radioactive. Most have fairly short half lives and were synthesized artificially during the twentieth century, by techniques such as neutron bombardment. Only thorium and uranium occur in significant amounts in nature, and trace amounts of plutonium have been found in uranium ores. Members of the latter half of the actinoid series have such exceedingly short half-lives that it is not feasible to investigate their chemistry. Some of the actinoids have been produced in sufficient quantities to study their chemical properties, and they show interesting phase behavior (see diagram above). Plutonium, for example, can reorganize its crystal structure significantly with relatively small changes in temperature, thereby altering its density (and volume) by up to 25 percent. Certain isotopes of uranium and plutonium are used as fuel in nuclear weapons and nuclear reactors, and some nuclear reactor designs involve the use of thorium. Currently, the U.S. military uses uranium in high-density penetrators that can pierce heavily armored targets. In addition, thorium is used to coat tungsten wiring in electronic equipment, and a technique known as "uranium-thorium dating" is used to determine the age of carbonate materials and fossils. One type of smoke detector contains a minute quantity of americium, which produces ionizing radiation. ↑ Raymond Chang, Chemistry (New York: McGraw Hill, 2007). Chang, Raymond. Chemistry. 9th ed. New York: McGraw-Hill Science/Engineering/Math, 2006. ISBN 0073221031. Cotton, F. Albert, and Geoffrey Wilkinson. Advanced Inorganic Chemistry. 4th ed. New York: Wiley, 1980. ISBN 0471027758. Greenwood, N.N. and A. Earnshaw. Chemistry of the Elements. 2nd ed. Oxford, U.K.; Burlington, MA: Butterworth-Heinemann, Elsevier Science, 1998. ISBN 0750633654. Online version. Retrieved May 14, 2013. Jones, Adrian P., Frances Wall, and C. Terry Williams (eds.). Rare Earth Minerals: Chemistry, Origin and Ore Deposits. The Mineralogical Society Series. London: Chapman and Hall, 1996. ISBN 978-0412610301. Stwertka, Albert. Guide to the Elements. Rev. ed. Oxford: Oxford University Press, 1998. ISBN 0195080831. History of "Inner transition element"
This page was last modified on 25 August 2016, at 20:09.